I do not think anybody actually likes paying income taxes, no matter what they say. True, the many benefits of taxes include things like roads, police, and even my beloved courthouses, but it is hard to part with a portion of every cent I earn. In a divorce, child support and spousal support issues have different tax consequences. In general, a child support payment is considered the paying party’s obligation to support his or her child, which every person in the United States has an obligation to do from their net income after paying income taxes. Because of this, child support payments are not tax deductible, though dependent children are. On the other hand, payment of alimony (or, in California, “spousal support”) is considered the sharing of income before the earning party has the opportunity to enjoy it. Because spousal support is the income of the party who is receiving it, and not the obligation every parent has to help support children, the paying party has traditionally been able to claim spousal support as a tax deduction, and the receiving party must pay regular income taxes on spousal support received. The instrument can’t specify terms that the payment is nondeductible and nontaxable. The parties can’t be living in the same household when the payment is made. The payor’s obligation to make the payment must end at the death of the recipient. 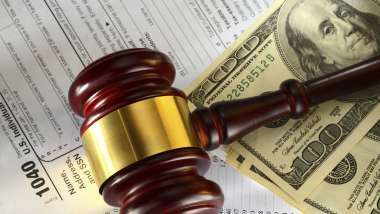 In other words, the IRS and tax courts will want a formal written order (even if agreed) that mandates the payment of spousal support before the paying party can deduct alimony payments from his or her taxable income. Such agreements are relatively simple, and there are forms on the California Courts website that you can use, but they do not always fit what a specific couple needs. A simple spousal support order should cost relatively little if you need to consult an attorney or a legal document preparer.